We are delighted to announce that our 20-day tour to Japan in October 2013 will now cost up to £300 less per person due to more favourable exchange rates. The reduction takes the original price of £5,187 down to £4,887pp (sharing a twin) and the single room supplement price is reduced by £25 to £395. 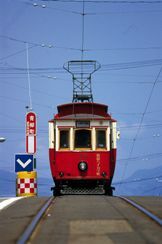 So if you are planning a BIG railway adventure for 2013 consider this newly reduced escorted Japan tour that will be a wonderful holiday - combining railways, both old and new, with some fabulous sightseeing. The tour begins with a three-night stay in Tokyo, enough time to explore this vibrant city and get a taste of its immaculately clean and efficient Metro and suburban trains. 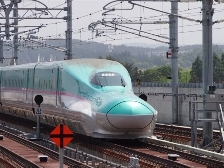 Our stay in the capital includes a trip on the Shinkansen Bullet train to Oyama, then by local electric train to Shimodate and finally the Mooka Railway steam train to Motegi. Normally hauled by a C11 Tank engine this is a gentle introduction to travel in Japan. We leave Tokyo for Niigata on the Japan Sea coast by steam in the form of the historic C57 hauled 'Banetsu Monogatari' for the 125 kilometres between Aizu-Wakamatsu and Niigata. Our journey continues along the scenic Japanese sea coast north to Akita where we take the 'Komachi' service along the ‘Mini Shinkansen’ line to Morioka, changing here for Aomori. We then travel through the Seikan Tunnel linking Honshu and Hokkaido to reach historic Hakodate for a 2-night stay. This city was the first to open to the west in the 19th Century and boasts an international feel with old churches and consulates connected. Its interesting tram network is of particular interest! Our next stop is the south eastern port of Kushiro for a 2-night stay. North of Kushiro is Japan's largest Marshland, Kushiro Marsh, now a National Park and home to about 20 Tancho Cranes visible all year round. A 3-night stay in Sapporo allows time to travel to Rankoshi on the Niseko steam train, hauled by a C62 class steam engine. We travel back to Honshu, along the Pacific side boarding the Shinkansen bullet service at Hachinohe to Sendai for a 2-night stay. Here we take a short trip along the coast by train to see the view of Matsushima Bay, with over 260 islands, regarded as one of Japan's three most scenic locations. Historic Nikko is our next stop for 2 nights. Nikko’s Temples and Shrines are world famous and quite enchanting, deep in the forests. Our return to Tokyo is on the 3ft 6ins gauge 'Bullet' trains operated by the Tobu Railway. The last rail run takes us out to Narita for our final night. This tour is indeed a railway odyssey that offers a comprehensive taste of Japan, blending its scenic beauty and culture with an abundance of historic and modern-day railways. We hope the £300 reduction will be an added temptation for you to join us on this escorted tour. For a fuller itinerary click on Japan – North to Hokkaido or contact me direct by emailing maria.cook@ffestiniogtravel.co.uk or call 01766 772030.